Back in 2012 I went on quite a few training rides with a great bunch of people called, 'Small Wheels Big Difference.' They were in training for an epic Lands End to John O'Groats on Brompton bicycles. Looking back on things I cannot quite remember how I ended up going on their first ride but think that it was merely a tweet put out by them asking if anyone wanted to join them. Things were quite different back then. I was quite unfit and carrying a few more lb. 's than I would have liked. I had a Raw Lacquer S2L and decided to take it with me on their training run from London to Cambridge. I found it demanding! I met Geoff S (I think for the for the first time) and also Isabel who I remembered as also riding an two speed but being incredibly fast! At the 2012 Brompton World Championships I remember saying hello to Issy and pleased for her that she got on the podium in the ladies category. Last year we bumped into each other again in the pens just before the race and I wished her luck. 2013 was to be the year Issy became the ladies Brompton World Champion and she has kindly took the time to answer a few questions. 1) You are the Brompton World Champion for 2013! congratulations again. Can you describe what it feels like? Thank you! It feels great to have won, especially against some really strong competition. 2) What sort of Brompton do you have and what made you buy a Brompton? I have a Turkish Green S2L Brompton. 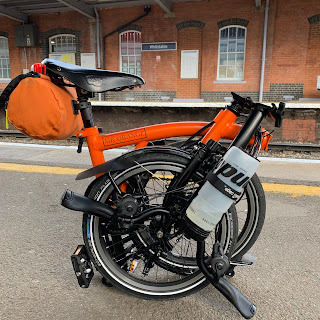 The reason I bought a Brompton was because I was getting fed up of my other half's worn out GT mountain bike for the commute, which I’d been riding for about a year. So I decided to buy a mountain bike. The first day I cycled to work on it, it was stolen, and this was only a day after I’d bought it! I'd seen Bromptons being ridden around London, and thought it would be ideal because I could take it into my office where it was much less likely to be stolen. 3) I first met you on a 'Small Wheel Big Difference' training ride when we cycled from London to Cambridge. Looking back at it I was fairly unfit compared to now but I remember thinking that you were speedy to say the least!! What have you done since then in terms of cycling and fitness that has allowed you get third place at the Brompton World Championships last year and winner this year? Since then I've just cycled more. I'm not a member of a gym, and I don't do much other exercise. I just like setting myself challenges. I joined a local cycling club and went on some rides with them, but I have to say I tend to ride by myself, which probably doesn't help me get much faster or become a better cyclist. I also tried my hand at a few races and added some extra miles to my commute by doing laps of Richmond Park, as well as rides out to Box Hill. Oh, I also bought a turbo trainer. 4) When I said hello to you on the grid you were very modest about another podium position. Did you have a game plan for this race? I did have a game plan!! I genuinely wanted to win. I realised the Goodwood circuit would be very open and windy, so I decided to form a team with two others: My husband and his brother, Jack. I thought team time trialling was ideal for the course, not that any of us had ever team time trialled before. It also helped with providing me with extra motivation and the occasional respite. This was because half-way round the course I was actually going to give up, so I told the others to go on without me. Jack then said to me that it was only 25 minutes of pain, and to just get on with it... so I did, mainly because I suddenly felt bad for making them take part on my behalf - they were pushing very hard themselves. There were a number of times before and during the race that I doubted that I could win because Julia Shaw is an exceptional Time Trialist, and there were some other very fast ladies out there. I knew I had the legs, but for me it’s all about getting into the right mindset, because I’ll shoot myself down and tell myself I can’t do it, when I know I can, so will just give up. If it wasn’t for Jack and Jordan telling me that I could do it, I might have slowed down. 5) You won the Brompton World Championships with a Brompton Dock hire bike. What were the reasons behind you not using your own bike? I actually won using my friend's 3 speed Brompton, Jordan used the hire bike and Jack used my S2L. The reason we did this was because Jack can ride at a much higher cadence than me, and I'm more suited to pushing bigger gears, so I took the 3 speed. It just seemed the right choice. 6) Did you do anything to the hire bike to get it ready for the race? We lowered the handlebars and changed to a firm suspension block for the day. We changed one of the tyres to a Kojak, but that's only because 20 minutes before the start of the race Jordan had a blow-out. That was slightly worrying! 7) I think it is great that someone might hire and use the bike you one the Brompton World Championships on. Surely the company behind it should gift the bike to you? We hired the bike through Brompton Dock. It wasn't technically the winning bike, so I didn't ask for a freebie. 8) I really liked the Goodwood circuit and put in a much better performance that last year at Blenheim. Which circuit do you prefer and why? Goodwood is a very open course, which makes it quite windy. Whereas Blenheim gives you respite as it has a relatively lengthy descent but the ascent beforehand isn't easy, especially the second time round. I think both are great courses, but I'm probably more suited to a flat course, like Goodwood. 9) What advice would you give to those of us who are already thinking about 2014? If you're in it to win it, or if you’re just after good time, then my advice is to cycle around 100 miles per week. Incorporate interval and hill training and learn to spin and push hard. Do a few long rides, and learn to stay ahead of the roadies!! From what I've heard, I think the BWC is going to be much more tactical this year, so forming a team is a great idea providing you do it safely and practice safely beforehand. Otherwise, just go and enjoy the atmosphere, as well as the free G & T! 10) How often do you cycle and do you have other bikes apart from your Brompton? I'm a commuter cyclist so I currently cycle twice a day five times a week, nine miles each way. 11) Talking of bikes what do you think of the Brompton you won? Will you use it to defend your title next year? The Brompton that I won is a 6 speed, so feels a much more relaxing ride in comparison to my sprinty 2 speed. I feel like it's bit of a trophy, so have only ridden it a couple of times. I'd probably use a 3 speed to compete in the BWC as that suits my riding style much better, but I won't be taking part this year as I'm expecting a baby in May/June. Plus, I've already dreamt that I'd lose, whereas the past two years I only dreamt that I'd win! 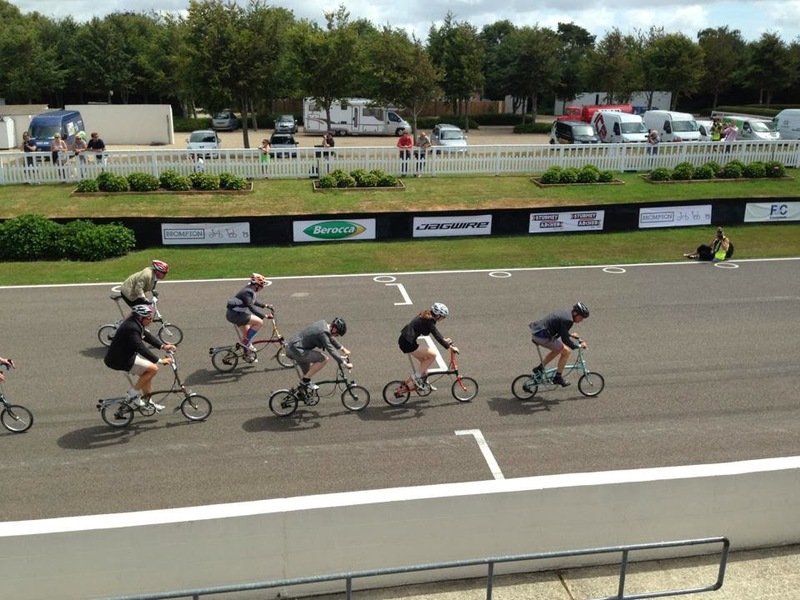 12) Your husband also took part in the Brompton World Championships and obtained a very good position. Does he own a Brompton and is there a heathy rivalry between you? No he doesn't have a Brompton, but he does use mine when he needs to. Like me, he's just a commuter cyclist and does relatively little else cycling-wise so we don't often ride together. He has a very competitive nature, but we're not particularly competitive with each other. I do remember years ago he used to tell me to go faster all the time whenever we did ride together. Nowadays he’s a bit more complimentary. 13) When riding one of my Brompton bikes on my daily commute I make a point of trying to overtake as many bikes as possible. What are your thoughts on this? Check out the SCR (Silly Commuting Racing) thread on the Bike Radar forum and you'll see it's a popular game (ahem *sport*) to take part in. I really enjoy chasing and riding with some very fast guys on my commute (safely). I'm going to miss it very much. 14) Cycling in London can be tough going. What do you think could/should be done to make cycling safer and a genuine alternative to the car or public transport? I think cyclists and drivers should have more training on road hazards and dangers and how to avoid them. I often find cyclists a bigger hazard than vehicles much of the time. Often cyclists just pull out in front of you without shoulder checking just as you're about to head past them. That said, I also have drivers pulling out right in front of me, although I'm going much faster than they probably realise. Motorists overtaking me only to turn left 10 yards or so later is also a common hazard. People just don't think. New infrastructure isn't going to come about tomorrow; we have to learn to get around safely together today. 15) Brompton users can be an eccentric bunch with many having a strange obsession with certain colours for example. What are your thoughts on Bromptonians? Ha ha! I can't think who you're talking about Mr. Orange Brompton ;)?!? I think Bromptonians are great, and it's a great way to show off your more colourful side, especially in London where everything can seem a little grey at times. I used to ride in the same colour green jacket as my Brompton, and people often commented that it made them smile whenever they saw my 'coordinated' outfit. A very big thank you to Issy for answering these questions. 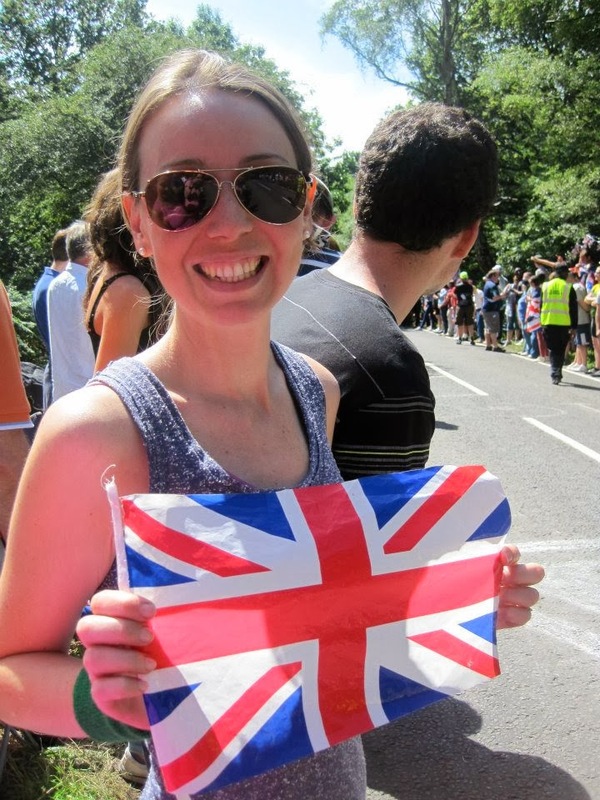 I wish Issy and her husband all the best for their new arrival in the summer and who knows we might see Issy competing at another Brompton World Championships in the future! As for me, I am going to try an not only get a game plan for the 2014 BWC but take inspiration from Jack's words, that it is only 25 minutes of pain and get on with it! In my case the pain might be there but it might well last a little more than 25 minutes! !